If you want to coordinate your scheduling with your personal biorhythm, this will no longer be a problem in the future, because with PC biorhythm V 1,3 you will be able to read off your current ups and downs directly from the display. All you have to do is to enter the year, the date and the time of your birth and the program will calculate your physical, mental and intellectual efficiency for the month indicated by you. You will then see at a glance, which days are best for your dates. Around the turn of the century different scientists discovered the existence of human rhythm waves of body, spirit and soul. In the last years again strong attention has been given to this analysis of the human condition. If you are interested in this method, you will be able to be recorded prepare with PC biorhythm 1,3 your biorhythm on your PC at home. For the calculation the program needs your year, -month, day and the exact time of your birth by indicating hours and minutes. Then you determine the year and the period for analysis. PC BIO provides you thereupon with a graphic monthly statement with the three rhythm waves as well as an additional wave -the so-called sensitivity phase which in sensitive human-beings is influenced by the phase of the moon.In the full version you can also have a displayed daily analysis, which contains a proportional analysis of the three curves for the desired day. If you want to plan tobs according to your personal biorhythm, the program with a list of particularly positive and negative days will help you.Just like a partner comparison this function is, however, only included in the full version. PC-BIO32 calculate a biorhythmanalysis and give you information about daily analysis, partner comparison, jewel therapy and asterisk etc. PC-BIO32 Biorhythm is a multilingual application that deals with biorhythms.Jewel therapy, allergy consultation, first assistance, emergency call numbers, and more are available from the attractive interface. Topshareware.com June 2004. 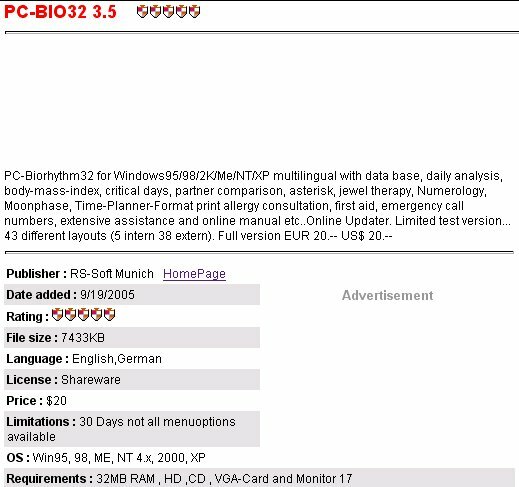 PC-BIO32 has been awarded the TOP score of 5-star by our editor! 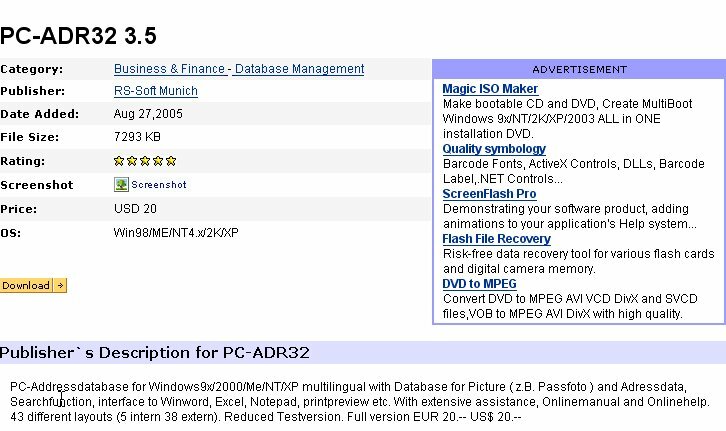 The TOP Rating of PC-INFO32 in the Assecurancejournal June 2004. Topshareware.com August 2004. PC-CHRONO32 has been awarded the TOP score of 5-star by our editor! 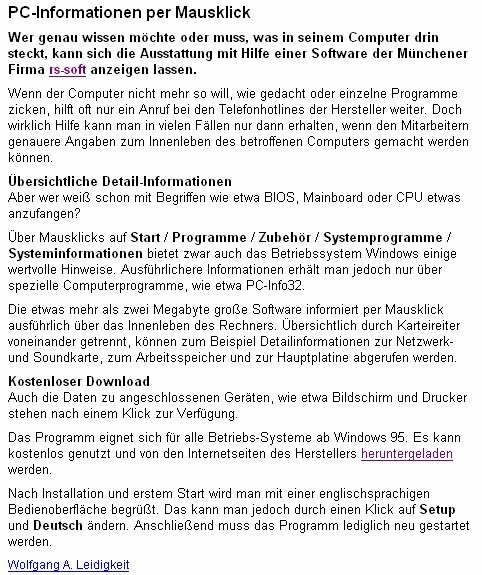 FileHeaven.com August 2004. PC-CHRONO32 has been awarded the TOP score of 5-star by our editor! Softcities.com August 2004. 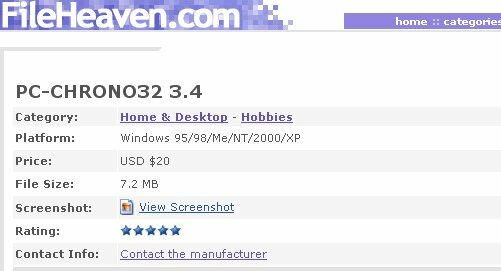 PC-CHRONO32 has been awarded the TOP score of 5-star by our editor!